Demand for filters in China will increase 14.0 percent per annum to 90.2 billion yuan in 2017. Motor vehicles and manufacturing will remain the largest markets, while the market for consumer filters will be expanded greatly by urbanization. Internal combustion engine (ICE) and related filters will be the largest and fastest growing product category. 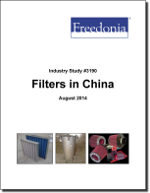 This study analyzes the 46.8 billion yuan filter industry in China. It presents historical demand data for 2002, 2007 and 2012, and forecasts for 2017 and 2022 by filter media (e.g., paper, fabric, activated carbon), product (e.g., internal combustion engine and related filters, fluid filters, air filters) and market (e.g., motor vehicles, other transportation equipment, manufacturing, utilities, consumer). The study also considers market environment factors, details industry structure, evaluates company market share and profiles 35 industry players, including Donaldson, UFI Filters, and Pall.